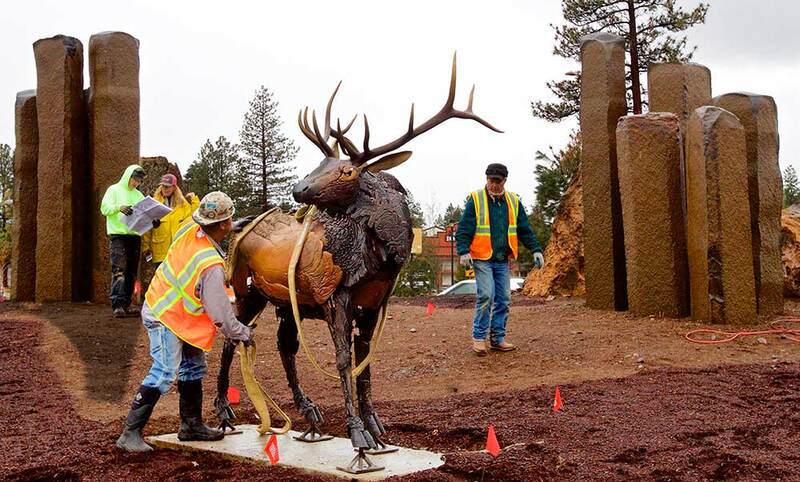 Large bronze statues of an elk and three antelope were lowered in place by a boom truck from Empire Stone. Bennett-Miller, a resident of Tumalo, was on hand, in her yellow rain slicker to stay dry in the morning drizzle, to oversee the placement of the statues. She had originally brought cardboard copies of the statues to determine the proper location for each art piece and, as the bronzes were placed one by one, it was obvious she had made the perfect selection for each statue. Traffic was heavy Monday morning around the intersection, with a number of oversized loads and a high volume of cars and trucks circling the roundabout while rocks and statues were being offloaded into the center of the roundabout. Bennett-Miller’s pleasure at seeing her installation take shape was evident. The artist estimated the elk probably weighs around 1,300 pounds, maybe more. The statues are all anchored in place with large bolts sunk into concrete pads with a few attachments to adjacent rocks. Many of the rocks used in the installation are nature’s works of art, with large basalt pillars from eastern Washington, lichen-covered pumice from Tumalo, and a variety of stones coming from Colorado and Montana, creating contrasting landscapes to complement the bronze statues. In an original landscaping bid, the stones alone came in at well over $100,000. Bennett-Miller went out and hand picked the stones, both from Empire Stone and also out in the countryside, and had them moved, for a total $20,000. For traffic traveling into Sisters from the northwest on Highway 20, their first view of the roundabout will highlight where they are headed — the High Desert with its grasses and sagebrush, populated by antelope. Traffic coming from the southeast on Highway 20 and headed toward the Willamette Valley will view what is ahead for them as they pass through the evergreen forests that are home to the bugling elk. The statues are crafted from hundreds of individual pieces of bronze that were first cast in wax and laid out on her studio floor. Bennett-Miller used an ordinary turkey roaster to melt the wax. She said by the time the pieces were all cast in bronze, she knew exactly what each piece was and where it belonged from having worked with them so closely for so long. Each statue is captivating for its form, variety of textures, and varying colors. The antelope really give the impression that they have just dashed from behind the basalt pillars. The elk’s proud stance and huge rack convey his forest majesty. Landscaping in the center of the roundabout and around the perimeter is scheduled for completion, and all work finished on the roundabout, in time for Memorial Day weekend and the beginning of Sisters’ tourist season. 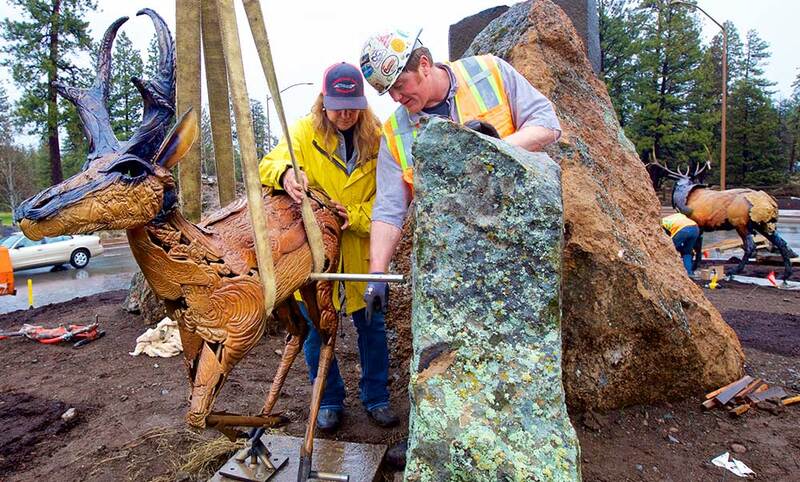 Roundabout Art Installed April 8, 2019 Installation of elk statue by Danae Bennett-Miller at the roundabout in Sisters.